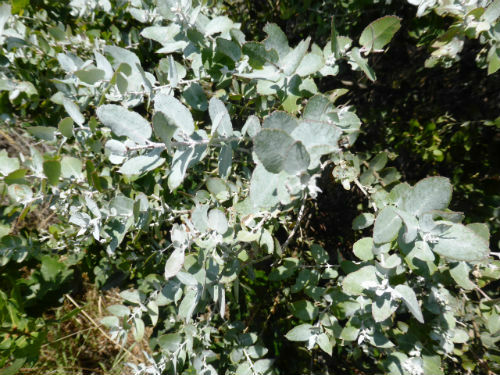 Eucalyptus crenulata, Buxton Gum or Silver Gum, is a medium-sized tree that will reach a height of 12 metres. Leaves are small, toothed, greenish-grey and used in cut flower arrangements. The foliage provides a contrast with other foliage in the garden. Leaf-eating insects such as scarabs seem to leave the foliage of the Buxton Gum alone. Profuse flowers are white to cream, in clusters of 7-11 and appear in spring. The small fruit is cup shaped and carried in tight clusters. E. crenulata is a versatile species that will survive and thrive in both moist and well drained situations. The species is probably too large for suburban gardens but would be at home on rural properties. E. crenulata is classified as rare because it is only known from two small forest reserves near Buxton, northwest of Melbourne, Victoria. The Buxton Gum is widely cultivated so there are probably more plants in cultivation than occur in the wild. The species was named from material collected in the Acheron Valley, near Buxton in 1938. The species name is from the Latin, crenulatus, minutely crenate. This refers to the scalloped leaf edges.